Handshakes come in all shapes and sizes. There’s the fist bump, the awkward turtle, the lumberjack, the turkey, the lobster claw. But, these aren’t the handshakes you want to bring to work. Your handshake is often someone’s first impression of you. It’s that first connection that sets the tone for an entire interview or client meeting. (No pressure.) Unfortunately, we’ve all been on the receiving end of a bad handshake which can only mean one thing: Lots of us are just doing it all wrong. When I extend my hand in greeting to someone at a business event, or even in my own office, I always wonder what I'll get in return. Will it be the enthusiastic hand pump, the confident squeeze, or the dreaded limp fish? I was taught at a very young age how to shake someone’s hand. “Riley, do your dishes.” “Riley, put your toys away.” “Riley, show me how to shake someone’s hand.” I wish I was kidding. But, then again, it’s a lesson I’ve taken with me on every job interview, meeting new colleagues, and even when sizing up competition in sporting events. You see, my mom is a director of her company. She’s pretty badass. She’s the one who taught me not only how to shake someone’s hand, but why your handshake matters so much. (She actually teaches a class on the art of handshaking to help her colleagues and direct reports learn how to properly greet a future client.) Now I’m here to share that wisdom with you. 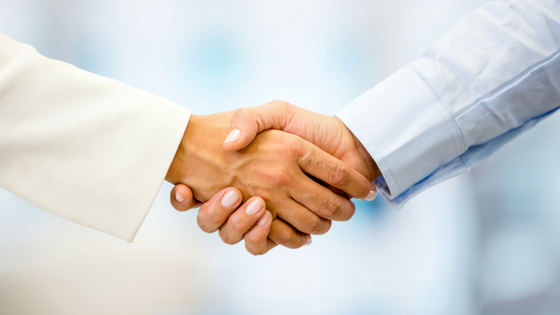 Your handshake conveys so much more than an initial greeting. In business, it’s your first connection with a client or candidate, and it can vastly alter the entire course of a meeting. Establishing that connection before diving into the content of a meeting allows the client or candidate to feel a sense of trust and welcoming the moment they step into the room. It’s also the first impression that a candidate or client is giving to you -- handshakes are a two way street, and both sides are equally as important. In fact, according to The Charisma Myth, a book all about personal magnetism, handshakes are so important during interviews that one Fortune 500 CEO once said if he had to decide between two candidates with similar qualifications, he'd give the position to the candidate with the better handshake. Perhaps that seems a bit far-fetched, but he isn’t the only one who judges job fit based off the power of a handshake. One study conducted by management experts at the University of Iowa analyzed candidate interactions in job interviews. What they found was that handshakes are “one of the first nonverbal clues we get about the person's overall personality, and that impression is what we remember." We’re trained on how to dress for an interview, and we’re even trained what to say and how to say it. So why aren’t we ever trained on quite possibly the most significant step of all? Long story short, handshakes are SO important. Especially in sales, a proper handshake can make or break a deal, and as a job candidate it could alter the entire course of your career. And to think that it all starts with this one simple gesture. I don’t have a 30-minute class to show you the art of handshaking, but I do have years of practice and advice from colleagues on how to perfect your handshake. So without further ado, here are five tips for taking your handshake from awkward to awesome. Extend your right hand. It’s customary to shake with your right hand, so make sure you freed up your right hand before walking into the room and shuffled any notebooks, pocketbooks, or laptops into your left hand. Do not put your other hand over the handshake either – you are not best friends (yet)! Eye contact is just as important as the handshake. When you extend your hand, look the other person in the eye and SMILE. Show them that you are present and appreciate their time. Last but not least, don’t forget to introduce yourself. “Hi, my name is (insert name here).” Showing your verbal confidence along with the eye contact and perfect handshake is the triple threat. It will help the hiring manager, customer, or someone at a networking event recall exactly who you are. Like anything, practice makes perfect. Walk around your office and shake hands with your colleagues. Practice introducing yourself in the elevator. Or, even try it out on your roommates or family. It may seem silly, but everyone can use more practice in the art of handshaking, and it just might help you seal the deal with a client or job position someday.